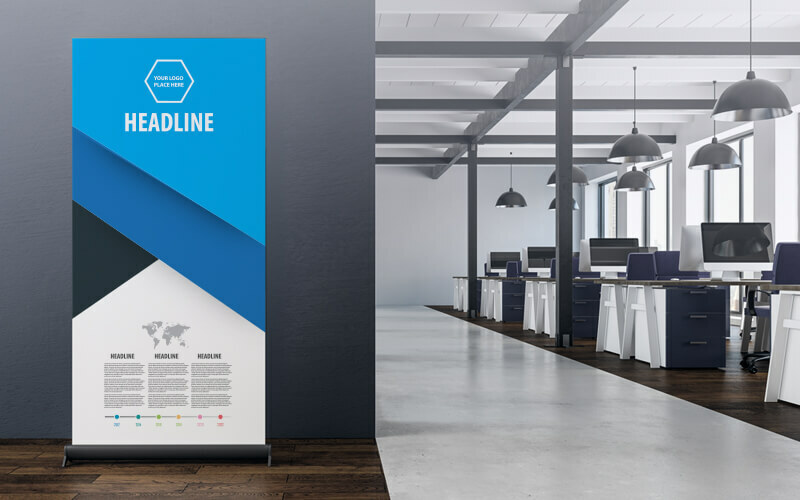 If you have a small business and are looking for new ways to advertise your brand, read this article to see how you can implement a roll up banner to your media. Despite businesses mostly going digital, the printing market is still very much alive. The advertising sector largely contributes to the increase in demand for large format printing because of the materials’ effectiveness in demanding the attention of consumers. One of the most effective, long-lasting, and economical advertising material is a roll up banner with a variety of uses. Not only will it do its job in advertising your business, it also provides a lot of advantages to businesses. Let’s discuss all the ways that your business, no matter what industry you’re in, will benefit from using stand up banners. Want to make a great first impression? Do it through a professionally made roll up banner. One look at your roll-up banners will give a person an immediate idea of your business. If you do it right, it will leave a good impression and most likely get the viewer to check you out. This will essentially be their first contact with your company, so make sure you make it count for them. In that sense, it’s a good idea to get a design that best represents your company. We usually recommend having your logo, name, and core message at the top so that these are the first things that a passer-by will see. Don’t forget that you can also be as creative as possible when doing your roll up banner design. You don’t have to stick with people in business suits or people typing away at their laptops. Have the supplier design the banner for you and communicate what you want it to exude if you’re not the creative type. Make sure that you use high-quality images, otherwise, the low resolution will reflect poorly on your company. Whether the roll-up banners are standing at a trade show, a convention, events, or outside your office, a properly designed pull-up banner will catch the attention of your target consumer. A roll-up banner usually stands at 2 metres, making it highly visible across the room. Almost everyone is bound to take a look at some point, so make that look count. Make sure you have a good pull-up banners design to make it more eye-catching. Use colors that pop to make a statement against the countless banners at an event, but don’t overdo as you also want the person to stay and read it. If your banner has too bright colors that are unpleasant to stare at, the person may abruptly leave. The perfect choice of colors would be the ones that tie in nicely with your logo and brand. If you’re going for a professional look, you might want to stick with a few colors and make use of white spaces. If, however, you’re a company that deals with art, showcase what you can do through the banner. Roll-up banners definitely look large, but as the name suggests, you can put it on a roll so you can carry it anywhere. It rarely goes over a 5 kg, and it usually comes with a carry bag so it’s always ready to go anywhere. It’s perfect for businesses with salesmen going to different places to advertise a product or to recruit, which will require them to travel light. Roll-up banners are also easy to pack up and to set up. It only requires one person without any technical expertise. The compact size also takes up a little space at your booth or outside your office. When you have limited space, roll-up banners are the best idea to advertise your business and catch the eye of consumers because of the large advertising space they offer. Its portability makes it a great investment as you can reuse it at all your events as long as it’s in good condition. Want to get the attention of passers-by outside your office or store? Get pull-up banners. Want to stand out in the sea of businesses at conventions and events? Use creative stand up banner designs. In short, wherever your business goes is the perfect place for roll-up banners. You can use the same ones over and over again or have a few that you can alternate depending on the location. That way, you’ll always be ready at a surprise conference, for example. Banners are relatively affordable, making it a great investment. You can use it to advertise your company, products, or services for a long time. High-quality materials are durable and will last for years, not to mention that they, coupled with a premium print finish, increase your perceived brand value. Vinyl is a good material that doesn’t crease and can withstand more wear and tear than other options. This should allow you to reuse the banners as you want without compromising the first impression of your customers. You don’t want to be using a banner with a cut or a crease, which will create a negative feeling toward your brand. If you’re on a tight budget, however, there are options that will last for a couple of usages. We’ve established the many uses of a pull-up banner, so there’s practically no reason to get one with an extremely short lifespan. A roll up banner provides maximum impact at a low cost, proving that it has a place in any business’ advertising campaign. If you’d like to get one or more for your company, contact us and we assure you only get premium banners for any use. We can also design it for you. Simply tell us what you want and we’ll deliver!